On August 1, at a hotel in Ginowan, the Japanese government and Ginowan City held a land return ceremony. 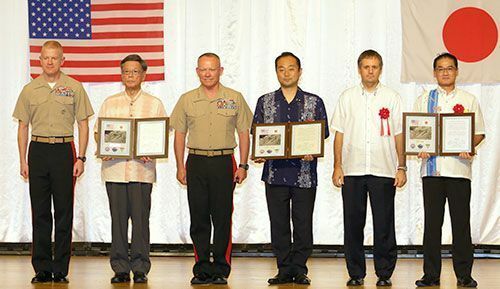 The United States government returned about four hectares, a part of land which is located on the east side of the U.S. Marine Corp Air Station Futenma (about 481 hectares), to the Japanese side on July 31. The returned land will be maintained as part of Ginowan City Route No. 11 after any environmental impacts have been removed. The land accounts for a mere 0.8% of the whole Futenma airfield. The government had hoped to highlight the result of its efforts to reduce the base burden on Okinawa. Instead, in his speech at the ceremony, Okinawa Governor Takeshi Onaga sought again to relocate the Futenma base out of the prefecture. Meanwhile, the central government continued to show support for the Henoko relocation plan. The ceremony has highlighted once again the deep rifts between the central government and the prefectural government over the “burden reduction”. Governor Onaga said he welcomed the returned land being used for the city road because, he said, it will contribute to improving the living environment. However, he asked the central government to grapple with relocating the Futenma base out of the prefecture and give the highest priority to protecting the neighboring people’s lives and properties. Ginowan Mayor Atsushi Sakima said it was a step toward the whole return of the Futenma base.